Awwww. Poor Jassart on Chapter 7 Page 14. Is Snow-by-Night leaving you hanging? The next page is one of Brittany’s best with an impressive coloring job from Naty. 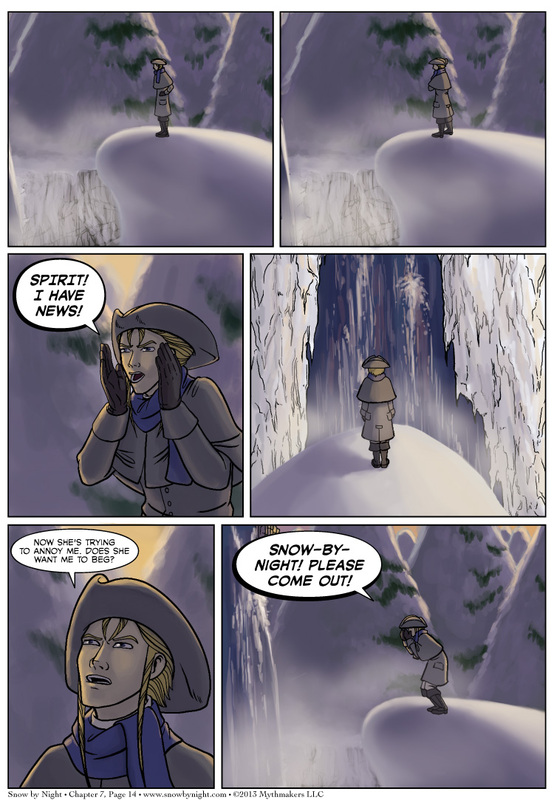 To see a preview, please vote for Snow by Night on Top Web Comics. I spent the past weekend at Intervention with some great webcomic artists. I had the pleasure of hosting Robin of Ley Lines for the weekend on her first excursion to the East Coast. We also met up with the Tangent Artists, Team Tamuran, Liz of Adrastus, Eric of Blade Bunny, Travis of Hainted Haller, and Zyren of LaSalle’s Legacy — all makers of excellent webcomics. Pete Abrams, of Sluggy Freelance and our king for the weekend, even socialized with us peasant rabble (and we gave him no end in grief for it). I got to meet Veronica of Bittersweet Candy Bowl. She is unbelievably sweet and I’m looking forward to reading the books I bought from her. I also met Aneeka from Not A Villain. She’s got a wicked sense of humor so I know I’m going to like reading her books. 1) Snow-by-Night might not be answering because she doesn’t like you, Jassart: you have been a selfish jerk. 2) Snow-by-Night might not be answering because she isn’t there: she and Blaise, whom she does like, might be off somewhere. 3) If you’re planning on tricking her into going to the Alchemist to get drained, this is a very bad idea: Blaise will hate you for it, and so will old man Winter when he hears about it. P.S.-Yes, I am in fact watching you as you stand there and yell at a waterfall.